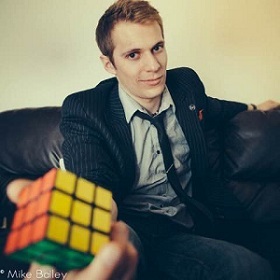 Chris Cook performs award-winning close-up magic in the North-West and across the UK for weddings, parties, corporate functions and special events. Chris has been a professional magician for ten years and has the expertise and experience to provide a unique and engaging performance for your wedding or party. His unforgettable style and charm will ensure that your guests will remember your event forever. Chris is based in Kendal, Cumbria and regularly performs in Windermere, Ambleside, Keswick, Penrith and all across the Lake District. Call Chris on 07974622727 to find out how Chris can make your event unforgettable. "Joel Dickinson is an astonishing Magician and a very talented entertainer. Based in the Lake District, Cumbria. Joel travels nationally and internationally to entertain and amaze. Joel will amaze your guests with his award winning magic. Joel performs for weddings, birthdays, corporate events and all party functions. Joel provides £10,0000 of insurance and is crb enhanced so you can book Joel with confidence!" Party Fun is run by a lady children's entertainer. Clients can select children's magic, face painting, balloon modelling, games, dancing and art and craft. At birthday parties the birthday child is made to feel the star of the show. Party Fun can entertain the children at birthday parties, school and village events, weddings and christenings. Face painting is offered at opening events, galas etc. Alan Stockdale is one of Cumbria’s finest close up magicians. Working within and around Carlisle in Cumbria. To see magic, performed in a close up environment is a thrilling experience. No camera tricks or second takes. Alan will perform feats, which will astound, amaze and amuse. Alan Stockdale aka TheMagicAl is accomplished in the art of close-up sleight-of-hand, can interact with guests. At their tables or strolling around the event. The perfect icebreaker for parties, sales events, meetings, or hospitality suites. Children's Party's are also allot of fun. Alan can offer children's magic, balloon Modelling and face painting. In contact with jugglers, fire eaters and unique entertainers call Alan to who can help with any size event. Martinys magic. expert in period presentations, stage magic and everything in-between!